Dec. 7, 2018, 6:49 a.m.
Plus: Are your Google results really that different from your neighbor’s? By Laura Hazard Owen @laurahazardowen Dec. 7, 2018, 6:49 a.m.
We’re not trapped in filter bubbles, but we like to act as if we are. Few people are in complete filter bubbles in which they only consume, say, Fox News, Matt Grossmann writes in a new report for Knight (and there’s a summary version of it on Medium here). But the “popular story of how media bubbles allegedly undermine democracy” is one that people actually seem to enjoy clinging to. “Media choice has become more of a vehicle of political self-expression than it once was,” Grossmann writes. “Partisans therefore tend to overestimate their use of partisan outlets, while most citizens tune out political news as best they can.” We use our consumption of certain media outlets as a way of signaling who we are, even if we A) actually read across fairly broad number of sources and/or B) actually don’t read all that much political news at all. This makes sense when you think about it in contexts beyond news — food, for instance. I might enjoy identifying myself on Instagram as a foodie who drinks a lot of cold brew and makes homemade bread, but I am also currently eating at a Chic-fil-A. The key insight is that people overreport their consumption of news and underreport its variety relative to the media consumption habits revealed through direct measurement. Partisans especially seem to report much higher rates of quintessential partisan media consumption (such as Rush Limbaugh listenership) and underreport the extent to which they use nonpartisan or ideologically misaligned outlets. People may explicitly tell interviewers they rely mostly on Fox News, while their web browsing histories and Facebook logs suggest they visit several different newspapers and CNN’s website (along with many apolitical sites). Republicans are not as addicted to Fox News as they claim, nor are Democrats as reliant on Rachel Maddow as they say. But that also means partisans now think of media consumption as an expressive political act, and therefore believe that they should stick to Fox, as right-thinking Republicans, or that they should be loyal to MSNBC, as right-thinking Democrats. 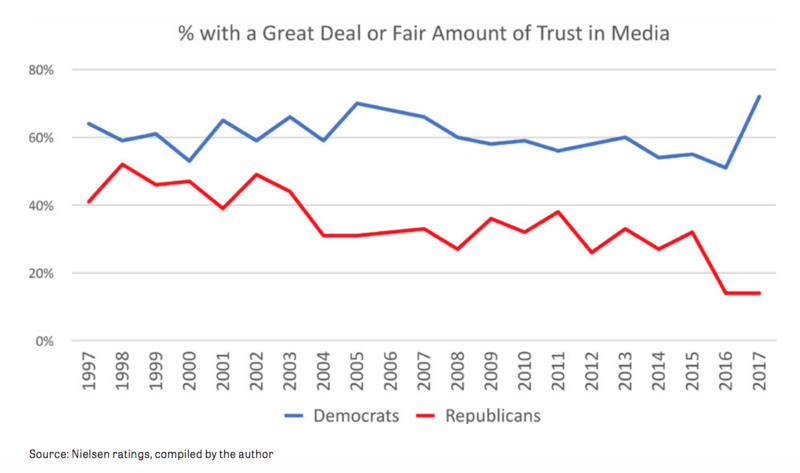 “Research findings thus far do not support expansive claims about partisan media bubbles or their consequences,” Grossmann writes, though this doesn’t mean that we can totally stop worrying about this; he argues we particularly need to work on strengthening local political news, as “we have a hyperpartisan and engaged subset of Americans who consume mostly national news of all kinds,” and a more robust local media could be a useful tool in drawing in the majority of Americans who consume little to no news at all. Different people, different Google results — but is that a filter bubble? Search engine DuckDuckGo — which, to be clear, is a Google competitor — published an examination of how Google’s search results differ by user. But are filter bubbles really the problem here? Danny Sullivan — cofounder of SearchEngineLand and now, yep, Google’s public search liasion — argues fairly persuasively that they’re not because even DuckDuckGo users see different results. Google also responded in this thread — watch that passive voice, though. In particular, the conversation often begins and ends with concerns around the filter bubble. I think many of the discussions in Silicon Valley are overly fixated on filter bubble concerns- while in the academic lit the filter bubble has often not stood up to empirical scrutiny. It's not clear that a pizza-optimized search engine is optimal for the broader public sphere. POSTED Dec. 7, 2018, 6:49 a.m.
Owen, Laura Hazard. "Few people are actually trapped in filter bubbles. Why do they like to say that they are?." Nieman Journalism Lab. Nieman Foundation for Journalism at Harvard, 7 Dec. 2018. Web. 23 Apr. 2019. Owen, Laura Hazard. "Few people are actually trapped in filter bubbles. Why do they like to say that they are?." Nieman Journalism Lab. Last modified December 7, 2018. Accessed April 23, 2019. https://www.niemanlab.org/2018/12/few-people-are-actually-trapped-in-filter-bubbles-why-do-they-like-to-say-that-they-are/. | title = Few people are actually trapped in filter bubbles. Why do they like to say that they are?